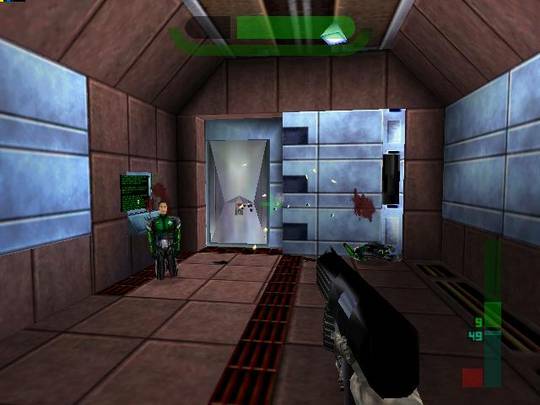 Perfect Dark is a first-person shooter that requires the Nintendo 64 Expansion Pak. As Agent Joanna Dark, your objective is to investigate the mysterious events at dataDyne by infiltrating its HQ and extracting Dr. Caroll in order to gain vital intel that could save the human race. There's seven modes (including solo, co-op and multiplayer), nine missions (with 1-3 levels each) and over 40 weapons and gadgets to use. The levels are huge, but rarely confusing due to the clever use of locked doors that indirectly guide you towards the correct route. There's an outstanding mix of varied locales, including the unforgettable Area 51 where you need to rescue an alien and then open hangar doors so it can escape in its UFO! There's many creative moments too, such as needing to wait for an enemy drone to pass in order to deactivate laser gates, or guiding an explosive HoverCrate past armed guards so you can blow up a marked wall. Like Goldeneye (1997, N64), upping the difficulty adds extra objectives and enemy locations to each mission, which is fantastic for replayability. Some missions can be a bit obtuse and confusing though, in the sense that you need to complete objectives in a certain order, otherwise trial-and-error rears its ugly head while you continually abort your attempts. The visuals are some of the best on the N64, with an enormous amount of detail in each level and some neat shadow effects; unfortunately, this does result in an inconsistent frame-rate that can dip into single figures when numerous enemies litter the screen. The dark and gritty music ramps up the intensity throughout, and there's lots of cinematic cut-scenes to tie the intriguing story together. Perfect Dark is one of the standout first-person shooters of its generation and its clever difficulty structure ensures that you have plenty of reasons to return to the game's superbly crafted levels. Although it perhaps pushes the humble N64 past its technical capabilities, it's still a blast to play from start to finish. Random trivia: A HD remaster was released on Xbox Live Arcade in 2010.